Previous Article “Patat met” mayonnaise from Amsterdam. Next Article Vegetables “en cocotte”. I have never had Ostritch meat. Few years back my siste rin law went for holiday in S.Africa and she said it was delicious. Beautiful. 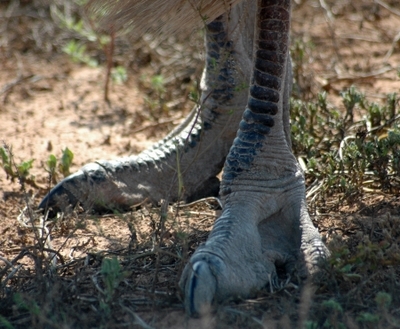 I love Ostrich. What a wonderful dish for this event. Thanks for this sobering reminder… And the humour to lighten the load just a little bit… the facial & pedicure! Your My French Kitchen photos are so beautiful – mouth watering! Oh – I wish I could live next door to you, Ronell!! I love the composition of that photo, and that fork is beautiful! What a great cause – and a great recipe. 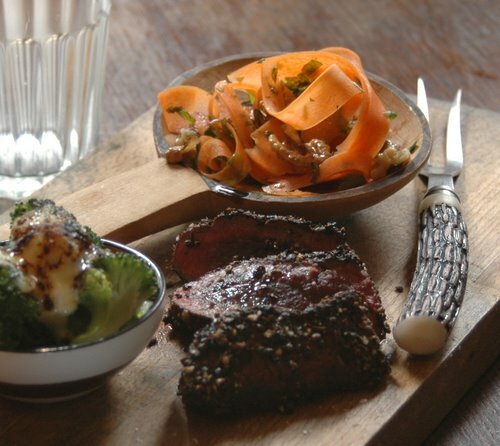 I find ostrich can be a bit heavy – it is such a dense meat – but I adore ostrich sausage and mince. Love the carrot salad too! How to grill the perfect medium ostrich steak. 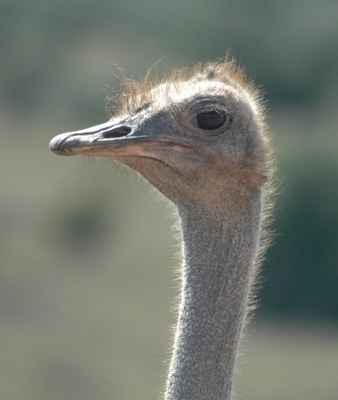 I am from Oudtshoorn at work in a Guest House near the ostriches…. see them every day…. said I would never never ever ever eat ostrich fillet and boy I missed a lot. You must the the fillet and pour over some basting sauce about half a cpu, only 15 minutes before frying or bbq it. I like to barbeque it and do it like this. The coals must be warm to hot. Put the steak on and turn after one minute. then one minute on the other side. then 3 minutes on each sie. This is for a 200gram piece. It will be red and juicy and tastes better that beef steak. The fillet will become dry the longer you bbq it. I also make a mushroom or pepper sauce with it to compliment the taste.